124a Kirkintilloch Road, Bishopbriggs Cross, Bishopbriggs, Glasgow, G64 2AB. Bishopbriggs Opening Hours. Monday - Friday: 9.30am till 5.30pm (Closed between 12.00pm and 2.00pm Friday). 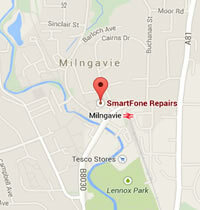 Saturday: 10.00am till 5.00PM SmartFone Milingavie. Smartfone is a company dedicated to smartphone repairs, we repair all brands of smartphones aswell as pc’s, laptops, ipods, ipads & gaming consoles. 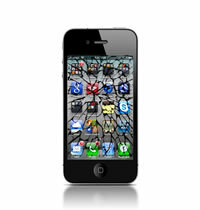 Smartphone repairs is our speciality whether it be a broken screen, liquid damage or full refurbishment we have the tools & expert staff to deal with all technical issues. Most repairs are turned around within 24hrs or less. We achieve this by having qualified, experienced & knowledgeable technicians who are always growing their skills base to tackle the toughest repair jobs. Close links with local, national & international suppliers enables us to source only the highest quality parts & therefore bring you the most cost effective prices available. 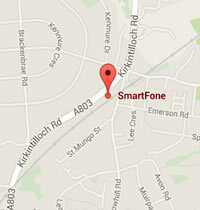 124a Kirkintilloch Road, Bishopbriggs, Glasgow, G64 2AB. Simply fill out the form bellow and get a quote emailed to you within 24 hours.